Indie developers feel that Nintendo didn't take downloadable games seriously on the Wii, and WiiWare suffered as a result. When Nintendo's WiiWare launched in 2008, allowing indie developers to make their games available for download on the insanely popular Wii, it had a lot of potential. Over the years, WiiWare did produce some memorable titles, including the critically praised Bit.Trip games. Though the series' developer Gaijin Games found success with the service, that doesn't mean it was fond of WiiWare. In a recent interview, Gaijin co-founders Alex Neuse and Mike Roush, along with several other indie developers, discussed Nintendo's downloadable services on the Wii and how it compared to the and Wii U. The good news is that the Wii U appears to be far more indie-friendly than its predecessor. Of course, it's probably not hard to improve on a service called "miserable" by those who used it. Complaints about WiiWare are nothing new; the lack of promotion and 40MB game size limit have been points of contention for game developers for years. Neuse believes part of the problem with WiiWare may have been that Nintendo didn't actually think people cared about downloading games. "We don't know for sure, but it felt like it wasn't taken seriously by Nintendo, the desire for gamers to buy stuff digitally," he said. Noting the platform's use of a single 144x90 image to promote its games, Roush added, "How are you supposed to display your wares with an image of that pixel dimension and really sell it... It was just miserable. I don't blame indies for not jumping on WiiWare." Despite the issues, Gaijin Games once again worked with Nintendo to bring Runner 2, the latest Bit.Trip game, to the Wii U as an eShop launch title. Debuting alongside Runner 2 was Chasing Aurora from developer Broken Rules, an indie developer that published And Yet it Moves on WiiWare in 2010. When comparing the services, Broken Rules developer Martin Pichlmair said, "Literally everything was easier this time around... It got better in several ways, how the financial side of things works." Roush echoed his sentiments, adding, "What's more friendly right out of the starting gate is the Wii U is developed for people to have an eShop to spend their money in and buy games easily." Despite the fact that Wii U's eShop is designed to be more developer-friendly, Neuse states the importance of Nintendo's promotion in order for it to be a success. "If Nintendo decides to forget about the eShop and they stop talking about it in the press and stop promoting it, it's going to die." The Wii U has only been on the market for about two months, so it's far too early into the console's life to label the eShop a success or failure. However, with large gaps between highly anticipated titles, a thriving downloadable platform full of exciting games would certainly make the Wii U a more appealing console. 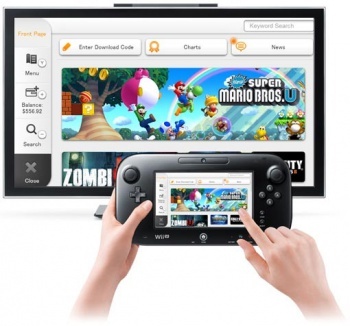 Offering more options to a wider range of developers is good for the industry, so hopefully Nintendo can continue to learn from its mistakes and support the eShop as it moves forward with the Wii U. Considering that Nintendo have gone full-on Valve with the eShop, and are not only allowing developers to patch stuff as much as they like for free (neither Microsoft or Sony do this, see the Fez debacle), but they're giving them complete control about how they price their own games and when to hold sales, I don't think they're going to have trouble attracting Indie devs this time round. They've already got Bit.Trip, Trine 2, Nano Assault Neo, Chasing Aurora, and The Cave either out or coming out very soon for the eShop. Even better, while Double Fine is relying on Sega to digitally distribute The Cave on PS360 (no doubt because of the charges incurred by MicroSony), they're releasing it themselves on the eShop, and will no doubt be getting all the profit from the Wii U version as a result. So yeah... if Nintendo can keep this zero-cost thing going, Indie devs are going to swarm to the system. Only thing Valve does that Nintendo doesn't is the sales. I don't think we'll see the sales aspect but I think Nintendo's new e-Shop is a massive improvement. The whole system used on the Wii could be very frustrating indeed. I somehow hadn't realized that The Cave was Double Fine. That changed my interest from "huh, that might be neat" to "take my money faster!" When you have clout the right way, things work like that. OT, though, I don't see Nintendo's motivation in not collecting any profit from the sales. I'm pretty sure Steam takes a cut, and obviously indie devs are quite fond of them. Is it just to court the developers and make very clear that this is much more than WiiWare 2.0? As Jeffers already said, the Wii U eShop is indeed letting devs choose their own prices and hold sales whenever they want. This has been confirmed by multiple sources. Isn't that like saying you're 1 up from the bottom of the barrel? They're not giving up royalty cuts from digital sales, as far as I'm aware. That would just be silly. What they're doing is not hitting developers with the same up-front costs that Microsoft and Sony charge for use of their services. If you want to put your game on Xbox Live, you have to pay Microsoft upfront to get it there. If you want to patch your game, that's another charge. For a lot of developers, those costs are simply too much. Which I imagine is why Double Fine have partnered with Sega to bring The Cave to PSN and XBL. As Nintendo doesn't charge for the same services (as far as I'm aware) that means Double Fine are able to bring The Cave to the eShop without the need for a publisher's financing. And it means that whenever someone downloads a game, apart from Nintendo's cut, all the profit is going to head straight back to the developer. That's one hell of a draw. The reason, I think, is simply because Nintendo realised they fucked up last time with WiiWare, and wanted to make an online marketplace as enticing for developers as possible to make up for it. Remember, unlike Microsoft and Sony, Nintendo is still run be game developers. I imagine they have a pretty good idea of what other developers want, as it'll be much the same as they want themselves. As I mentioned, there will be sales. Nintendo is allowing developers to price stuff however they want, and to put stuff on sale whenever they want. Sales on the eShop are going to be based around what the developer believes best suits their game. Again, for a console marketplace, that's pretty huge. Regarding your first point, Nintendo is still carrying out QA checks on any game developers want to release on the eShop. It's not just about quality standards, but making sure that games on the system don't use copyrighted materials, plagiarised assets, or generally do anything illegal. There are developers out there who are perfectly fine with stealing other people's stuff and putting it into their own game. You may or may not remember Limbo Of The Lost from a few years ago, which was basically a broken game with stolen assets from other games and films. QA checks not only make sure that a game is playable, but that it can't be sued for copyright infringement or anything. The last thing any publisher wants is for one of the games on their marketplace to get nailed for plagiarism. Shovelware may or may not get curbed. I think it will prolly go on a case-by-case system. Nintendo have said they want to focus less on casual games this time round, but at the same time, a lot of the so-called 'shovelware' on the Wii sold a lot of copies, and prolly gave Nintendo a lot of royalties. At the end of the day, I think shovelware is one of those things that affects any truly popular console. The PS2 is seen by many as the best console of all time, but before the Wii came out, it was the shovelware dumping ground of choice. Any console that gets popular is going to get publishers trying to make a quick buck off of cheap titles, and it's not something you can really prevent against. I mean, Nintendo did that whole Seal Of Approval thing after the Videogame Crash of 83, but that was more marketing than anything.